Getting dressed can cause a great deal of stress for some women. The clothes we wear say a lot about us, yet a lot of us hate our clothing and we do not like getting dressed in the morning. 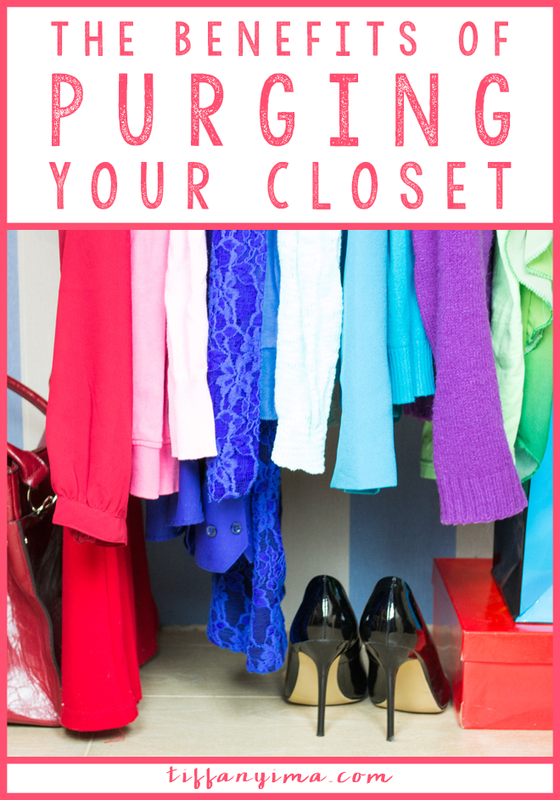 Click through and let's learn together the benefits of purging your closet. Feel like you never have anything to wear? Do you find yourself aimlessly wandering around the mall and stopping at sales? Dang. Why do you know my life? When I answered yes to all of those questions, I knew that my cluttered life originated in my need to be surrounded by clothes. I couldn't take the mess anymore. So out went 10 pairs of shoes, 4 plastic bins, and 3 garbage bags of clothing. After that, I STILL was getting rid of clothes for weeks, so if that gives you any clue to how much crap was overloading my closet, you understand the need for the purge. If you also answered yes to these questions, it is time for you to purge your closet. I know that it sounds counter productive since you feel like you have nothing to wear but that is because your closet is full of clothes that you hate, don't fit you, aren't the right color etcetera. Getting rid of the clothing that you don't need is a liberating feeling but can be an emotional and physical drain. Here is a guide that will help you to effectively purge your closet. Having more in your closet does not mean you will have more options. It could only mean that you will have more junk. Living a life surrounded by clutter is not a step toward balance it is a step toward stress. Your living environment can cause some serious strain on you emotionally. For me, I get to a place where I feel stuck. I feel like I cannot do anything and the clutter just keeps building. When I feel that way, I know that getting rid of some things can only cause me relief. In essence, purging can help you discover your style, have less clutter, less stress, efficient outfit building, and you'll spend less money. "Do not lay up for yourselves treasures on earth, where moth and rust destroy and where thieves break in and steal, but lay up for yourselves treasures in heaven, where neither moth nor rust destroys and where thieves do not break in and steal. For where your treasure is, there your heart will be also. No one can serve two masters, for either he will hate the one and love the other, or he will be devoted to the one and despise the other. You cannot serve God and money"
I also found this great article on Time Magazine that talks about how unhealthy it is to be attached to possessions. When we find ourselves extremely wrapped up in the things we have we also find ourselves suffering a great deal when these possessions are lost. If I lose everything, I want to be able to pick myself up and keep it moving. Don't get me wrong, I STILL love clothes, and I still own a good amount, but I also know how to get things out. I have them, but I know I can do without them that is the lesson that I learned. I mentioned that the process of purging your closet can be a physical and emotional strainespecially if it is something you have not done in years. There are many reasons why we hold on to things. Sometimes, we have our "skinny" clothes for when we can finally fit them again, we have our "fond" clothing that bring back great memories, we have "nice" clothes that we are afraid to wear, and we have the clothes that we paid to much for so we can't part with them. In order to purge your closet effectively, try to have you mindset on the overall benefit of having a streamlined closet. I am telling you, I stress out way less about what I am to wear. Before I give you the five simple steps to purge your closet, I encourage your to take the time to prepare your mind and get ready for some emotions to flow out. It can get frustrating and tiresome so it will work better if your mind is ready to let go.